_ Hundreds of refugees have perished in Europe’s so-called ‘river of death’ on the Turkish-Greek border. Earlier this year, The Turban Times and Refugee.Today travelled to the border area on the edge of Europe to uncover some of the stories. 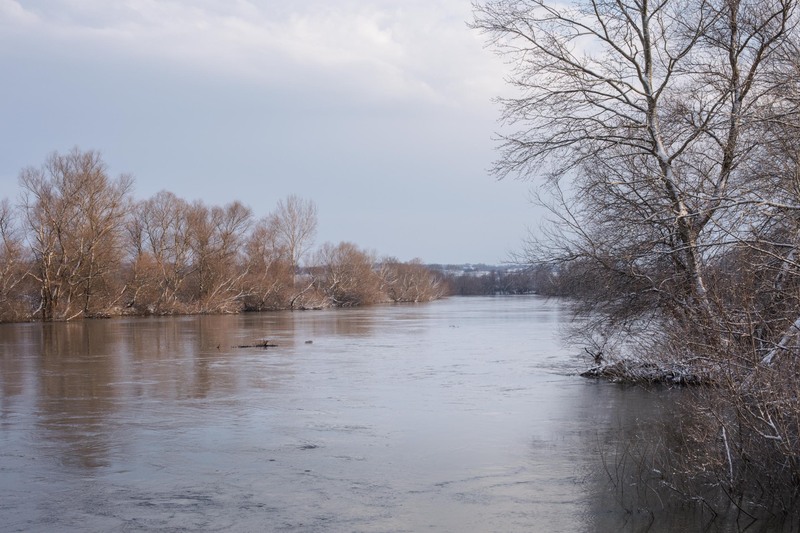 NORTHERN GREECE — The peaceful, snow-covered landscape around the Evros river in Northeastern Greece doesn’t provide many clues about the tragedies that have occurred here in the past decade. 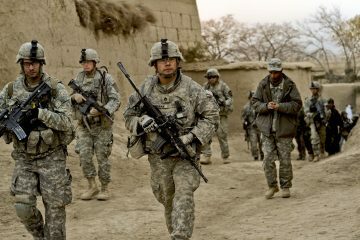 But if you take a closer look, the odds and ends of men, women and children, who have crossed the river, are scattered around in surrounding creeks, abandoned military posts and on the nearby train tracks. Since the beginning of this millenium, hundreds of refugees have perished in their attempt to cross the Evros river, separating Greece and Turkey. While many people are aware of the reoccurring tragedies of refugees drowning in the Mediterranean Sea, the faith of Evros’ victims remain a relatively uncovered story. Our journey starts at the University Hospital of Alexandroupolis, the largest city on the Greek side of the river. 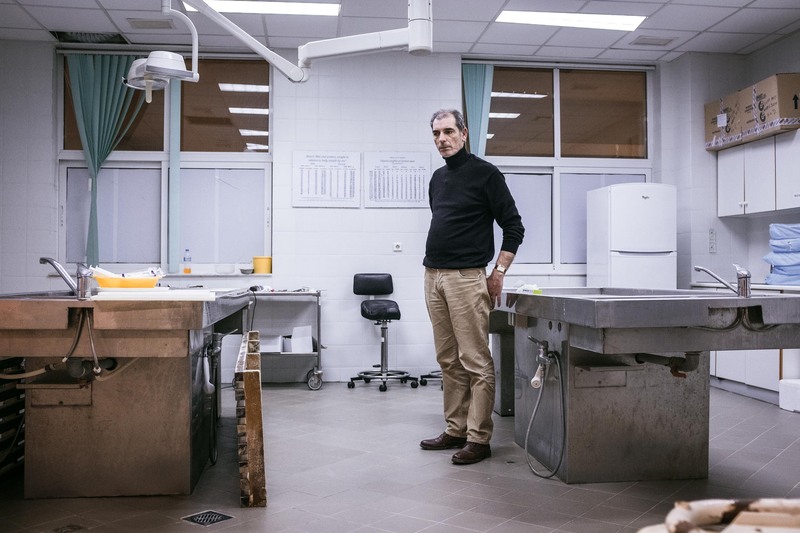 In the hospital’s dingy basement lies the Forensic Department that receives all the retrieved bodies found by Greek authorities. A tall, gaunt, grey-haired man in a black polo neck sweater welcomes us in his office with a fuming cigaret balancing between his fingers. Doctor Pavlos Pavlidis is quick to skip the introductional small talk. He unfolds a map of Northern Greece on his desk while marking a line with his pen. “The border is about 196 kilometers (121 miles) and it’s the river itself that constitutes the border with Turkey,” he says with a heavy and charismatic Mediterranean accent. For 18 years Doctor Pavlidis has been in charge of the Forensic Department at the hospital. During this period, he has attempted to identify the bodies of 359 refugees, who were found dead in and around the Evros river. He takes a seat and begins scrolling through case files on his computer before halting at one case that looks particularly macabre. “This man died from post-mortal injuries. The birds ate his eyes after he was dead,” he explains. “The police found his passport and 900 dollars. He was Palestinian according to his passport, but we are now waiting for the Document Authorization Center in Athens to confirm whether this is a real passport or not,” Pavlidis says. So far, the professor has received three dead refugees this year. He opens the file of the first victim of 2018. The only remaining personal belonging to identify the individual is a silver necklace with a heart-shaped pendant reading “heart to you”. He shows us another picture of a decayed corpse from last year that has been in the river for at least 30 days. The man’s face is obliterated from being in the water too long. “The identification of such a person is difficult or impossible,” Pavlidis says while shrugging his shoulders. “It’s very difficult to identify most of the people, because we find them after several months in the water and they are unrecognizable,” he explains. These words somewhat explain the challenge of Doctor Pavlidis’ job as a medical examiner. He’s not only a doctor, but also an investigator to some extent, who sometimes seems to be on an almost impossible mission to identify the unidentifiable. Nevertheless, he has managed to identify 40 percent of the refugees who have drowned in the river since he took over the Forensic Department at the hospital in year 2000. The majority of the 359 retrieved corpses died by drowning in the river or by hypothermia after crossing it. Another common cause of death was landmines, until the border area was cleared of explosives back in 2008. “These numbers are only from the Greek side. We don’t have any information about how many people have been found on the Turkish side of the river, because we don’t communicate with the Turkish authorities,” Doctor Pavlos Pavlidis says, adding that he supposes the numbers are around the same on the neighbouring side. On his bookshelf, Pavlidis keeps a white box with personal belongings of the river’s victims, containing everything from bracelets to credit cards and smartphones. “When an individual is unrecognizable, I collect these personal belongings or look at characteristics such as tattoos, because family members will recognize these things,” Pavlidis explains. The only difficult thing for me is the children. The children are always the worst. These days, the Greek coroner doesn’t receive as many corpses as he did when the refugee crisis was at its highest in 2014 to 2016. 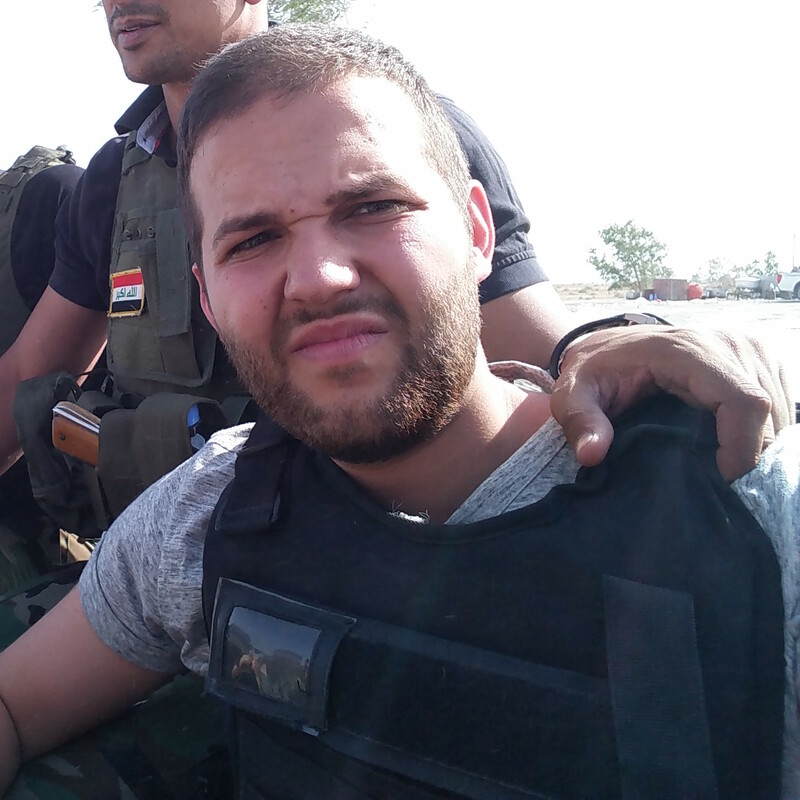 Back then, he didn’t have enough space for all the bodies at the hospital’s morgue and he had to place the refugees in containers stationed in the hospital’s parking lot. Despite refraining from expressing any personal sentiments or feelings, when talking about the victims, one case in particular seems to have imprinted itself in Pavlidis’ remembrance. 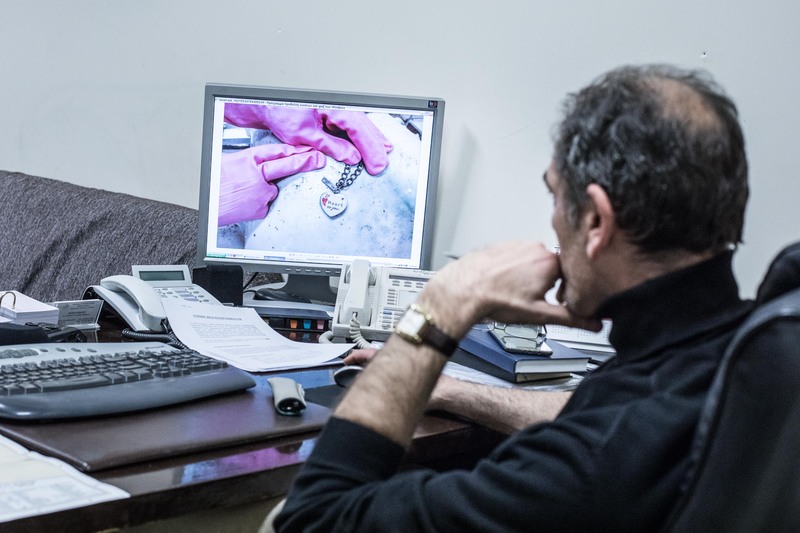 Before we leave the Forensic Department, he shows us the case file of a five-year-old Syrian girl, Rand al-Hayek, who was killed after initially crossing the river with her parents and siblings. The family of six were walking by the train tracks to find a town with shelter. They didn’t hear the speeding cargo train coming and it had no lights on in the dark to warn them. In a split second, another tragedy had occurred on the border. 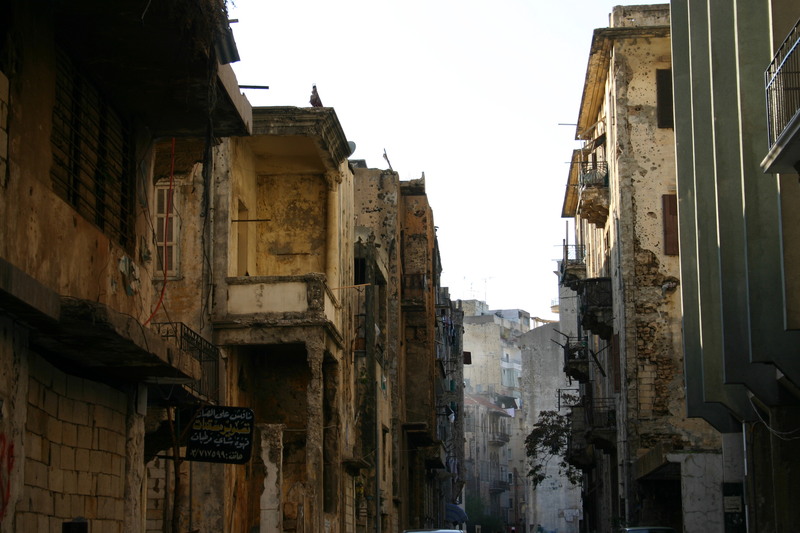 Rand al-Hayek was later buried in a Greek Muslim village further north. Late in the evening, we reach the northern mountain village of Sidiro, where deceased refugees are buried. We encounter a villager, who agrees to take us in his jeep to the graveyard located on the top of a steep hill overlooking the village. The gravestones are carved with Arabic writing and half-covered in snow. We find the gravestone of a Palestinian man from the Yarmouk Camp in Damascus and a Syrian man from Aleppo. Some gravestones have no names written on them. 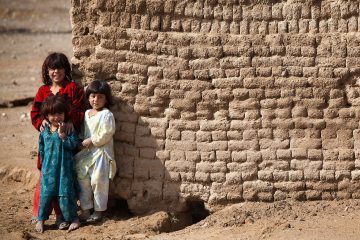 These are the unidentified refugees, we understand from the hand gestures of the local villager. Dusk is settling on the cemetery and he calls the local Arabic-speaking imam, who invites us over for tea. 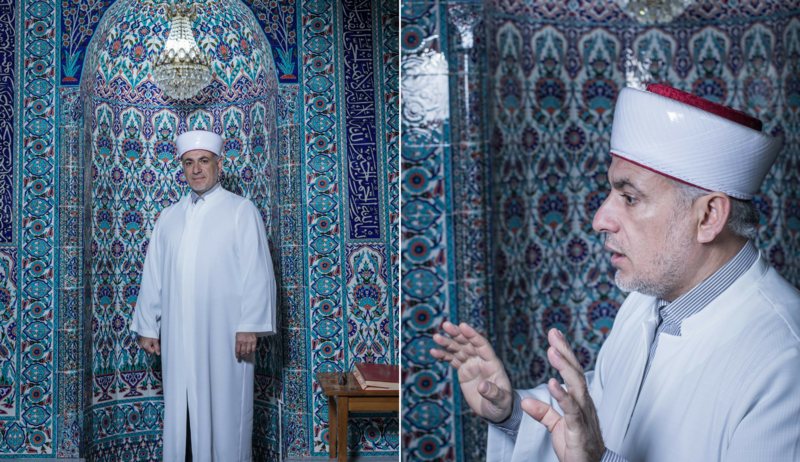 Returning from the hilltop, we are welcomed by Imam Abdullah Sherif, who lives next to a Turkish-styled mosque, of which he is in charge, at the center of the sparsely populated village. Imam Abdullah Sherif is from a family of Islamic scholars living in the Northeastern Greek mountain village of Sidiro. The Sherif family has been trusted by Greek authorities with the task of burying the victims of the Evros river, a majority of whom are Muslims. 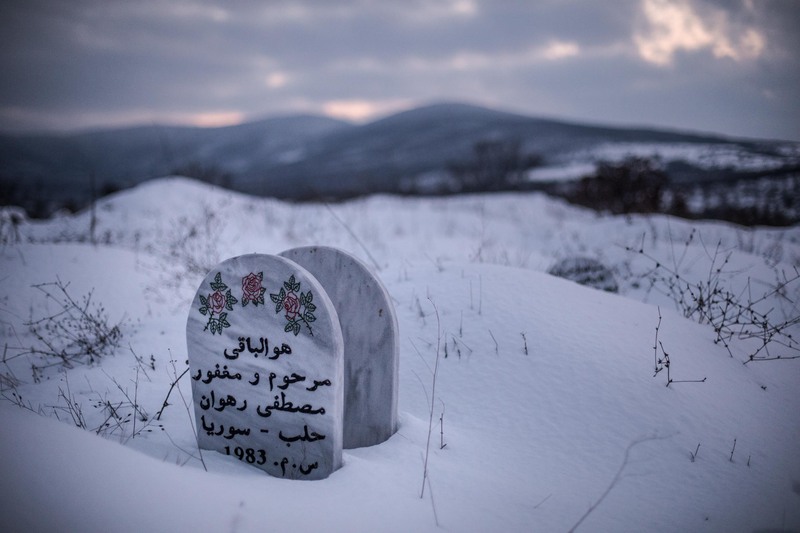 In the past two decades, the family has buried around 300 refugees, most of them unidentified men. The refugees, who manage to cross the border alive, are often met by helping hands from the Muslim villagers. Shelter and food is offered to refugees before their journey onwards. From the loudspeakers of the mosque, the call to prayer interrupts our conversation. We follow Imam Sherif heading to lead the evening prayer for around 30 villagers attending tonight. After the prayer, Imam Sherif, standing in his white Islamic scholarly garments with a white turban on his head, continues where we left. Sherif doesn’t know why the man was shot. Both Turkish and Greek authorities have been accused of shooting at refugees and migrants before, but with no further information about the case, any notion of blame remains speculative. 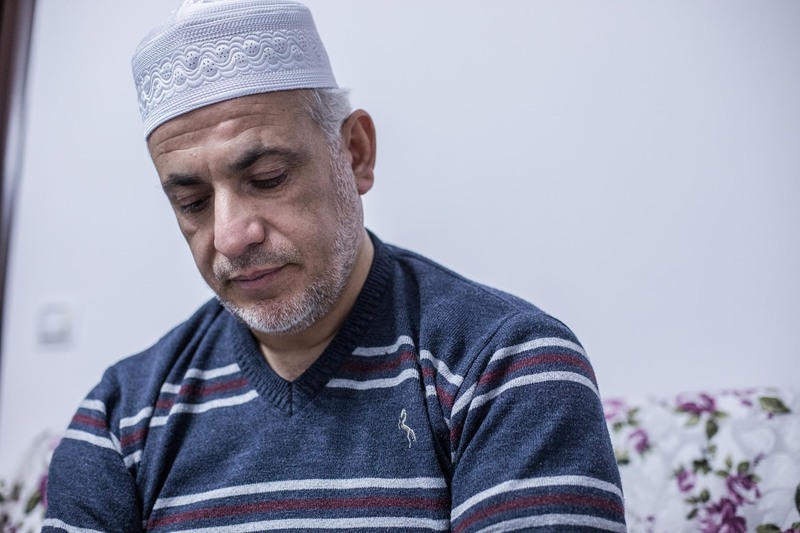 Despite his good relations with Greek authorities, Imam Abdullah Sherif further expresses his concerns about illegal deportations of Syrians back to Turkey, also known as ‘forced pushbacks’. “If a Syrian is caught in Komotini, he will get asylum. But if a Syrian is caught by the authorities in this area, he will be sent back against his will. I am truly baffled by this. I met a Syrian man who had been caught and deported back to Turkey five times by the Greek authorities,” he explains. I will carry you on my head. I will do everything in my power to help you. Greek Police has regularly been accused of systematically forcing back refugees in the border area with Turkey, which is illegal under international law. We have also spoken on the phone with two refugees living in Germany who had both experienced a forced pushback. They were caught by Greek police in broad daylight and turned over to the Turks at the border crossing by night. 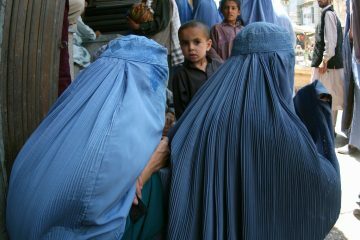 They wished to remain anonymous due to their pending asylum cases. On this journey to Europe’s outlying border, The Turban Times and Refugee.Today followed the trail of refugees who lost their lives in the river separating the European Union and Turkey. Standing at the edge of the river, the water flows slowly, almost peacefully. An old Arabic saying goes, ‘don’t fear the river with heavy currents, fear the one that is silent’. If there is any truth to this old aphorism, the Evros is a living proof of it. It’s hard to believe that so many lives have perished in its depth. So many stories have gone untold. Disappeared and forever forgotten in the merciless streams and the muddy bottom of the Evros river. While we often hear of the thousands of refugees who lost their lives in the Mediterranean Sea, countless people have been killed as well, trying to cross this natural border of Europe. Just two weeks before we arrived, a Turkish school teacher and her two children, fleeing Erdogan’s crackdown on Gülen supporters, drowned in the Evros along with five others. This scene repeated itself in July, when another Turkish mother drowned along her three children. The stories only made it to local Greek and Turkish newspapers. According to Dr. Pavlos Pavlidis’ estimates, around 1,300 people have lost their lives in the Evros. Many of the bodies remain unrecovered on the swampy bottom of the river. Now, a new winter is approaching and another high season of tragedies is slowly coming closer at Europe’s river of death. Since we visited the Alexandroupolis morgue in March this year, Dr. Pavlidis has received 21 bodies from the river, making the total number rise to 380 recovered corpses on the Greek side of the river since year 2000. When you are trying to forget the past, there is no reason to write it down in a history textbook.